You have a lot of choices when picking out upholstery fabric – at The Fabric House, we offer hundreds of in-stock options and thousands of special-order fabric options that you can get in store or buy online. Since new upholstery can lend itself to a “commitment”, either in the amount of time you’ll keep the piece and/or what you want to spend, there can be quite a few factors to take into account when looking at that wide range of upholstery fabric options….and our fabric store is here to help! Blending in versus standing out: Ensuring you choose the right upholstery fabric will be easier when you look at the current decor in the room and know whether you’re trying to blend the new fabric in with the existing color palette or have it be more contrasting and stand out. 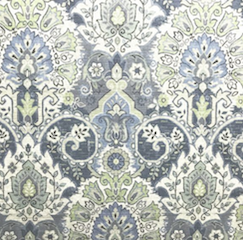 Want upholstery fabric that goes seamlessly with gray walls with cool undertones? Consider something in a soft blue or mint green. Looking for something bolder? Choose a pattern featuring a range of terra cotta or citron hues. Level of fabric durability needed: Is your new fabric going on an everyday piece that will get lots of use, or do you have children/pets in your home? Focus on the durability. We help our customers with this by labeling fabrics with the RUB COUNT if the manufacturer has tested the fabric. If the fabric has a 15,000 to 30,000 rub count, it is considered to be suitable for residential use. A fabric for commercial use will have a rub count of 30,000 or more. Size & shape: Picking upholstery fabric for a sofa requires a different approach than for a statement chair. Larger pieces generally benefit from a fabric that’s a neutral/solid color (easier to enjoy – and live with – longer), whereas pillows or an accent piece provide a great way to incorporate patterns or colors that may be a little trendier/eye catching. Also, take into account that it’s more difficult to make fabric with a bolder texture or pattern closely follow a curvier-shaped item, so solid upholstery fabric is generally a better choice for something with angles. Potential to fade: When purchasing upholstery fabric, it’s very important to consider the room – and location within the room – that it’s being placed in. Does the room get a lot of sunlight? If so, it would be advisable to invest in a fabric that is already lightly toned rather than dark colored. We are one of the few retail stores in the country that can sell Sunbrella fabrics directly from the mill – Sunbrella fabrics can be used inside as well as outside and are fade-resistant. Another brand to consider that you can find at The Fabric House is Inside-Out, which is a high-quality indoor/outdoor line. One thing to keep in mind: Don’t use spun polyesters for inside upholstery use – they might have pretty designs but most manufacturers of these products will not stand behind your chair if it wears out quickly. Cleanability: Not surprisingly, many of our customers are very concerned about the cleanability of a fabric they’re considering. Although most fabrics recommend dry-cleaning, if you have children, pets or messy friends or family, we recommend CRYPTON fabrics. You can spill a glass of red wine on the fabric and wipe if right off. Paw prints, crayon, ink and other items can also easily be cleaned off. There is even a kit available for stains that are especially difficult to remove. We also offer choices of other manufacturers who make high-performance fabrics similar to Crypton. As you can see, a lot goes into picking the right upholstery fabric, but what might seem a little overwhelming initially can result in something that’s worth all the thought and effort if you follow the guidelines above. 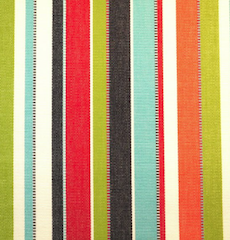 With all the choices of fabric we offer, you’re bound to find the perfect color and pattern for your project! And we’re happy to order a fabric we may not have on hand – for example, if you want to use vinyl or leather, we have hundreds of colors and styles we can special order for you! 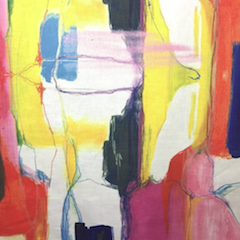 You can contact us with any questions – our expert staff at The Fabric House is ready to assist you in choosing the right fabric, answering any questions you may have or giving you design ideas for pillows and drapes to go with your upholstered piece. We can even order chairs and ottomans out of any of our fabrics or leather samples. Although we don’t do upholstery work, we are happy to provide you with a list of local upholsterers our customers have been happy with. So don’t hesitate any longer – check out our wide selection in our Nashville store or buy fabric online to get your project started today!